The province is located on the coast of the Andaman Sea, and contains 46 islands together with the mainland area. There are only few plains, and most of the area is hills. The Khao Luang and the Banthat mountain range are the sources of the two main rivers of the province, the Trang River and the Palian River. It has along western coastline of about 119 kilometres. 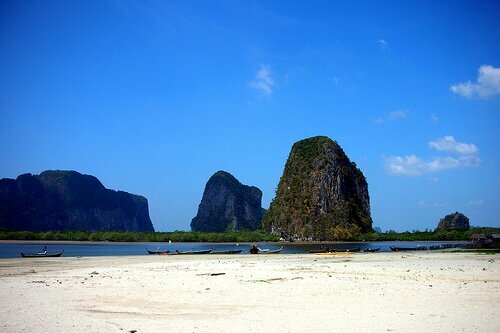 The province consists of an archipelago in the Andaman Sea with over 46 islands. Of these, 12 are in Amphoe Kantang, 13 in Amphoe Palian and 21 in Amphoe Sikao. The best time for sea travel is during October to May. Situated along the Andaman coast, Trang province is home to innumerable beautiful islands, while the mountainous eastern region is home to dramatic waterfalls, caves and pristine jungle. Between the mountains and the coast are extensive plantations of rubber. The southern coast of the province is protected in the Mu Ko Phetra National Park. The estuary of the Trang River together with the Hat Chao Mai Marine National Park and Ko Libong Non-hunting Area are also a registered Ramsar wetland. Trang was an important sea port of southern Thailand. According to legend the ships always arrived at morning, which lead to the name of the town - Trang derives from the Malay word for dawn. According to cultural records Trang used to be one of 12 satellite towns that came into existence 900 years ago, but it was only during the era of King Rama II that the place was recognized and the province got its first governor. The first Westerner to arrive in Trang was Captain James Low in 1838 to negotiate commercial benefits. Actually, the town was located in the Khuanthani (now a tambon in district Kantang). In 1893, the then governor Phraya Ratsadanupradit Mahison Phakdi, planning to make Trang an important seaport to the west, relocated the town to district Kantang which is at Trang River delta. It was moved again to its present location 26 km inland in 1916 by King Rama VI due to repeated floodings. The Trang area was the first area of Thailand where rubber trees were planted, brought there by governor Phraya Ratsadanupradit Mahison Phakdi from Malaysia in 1899. Trang is subdivided into 10 districts (Amphoe). These are further subdivided into 87 subdistricts (tambon) and 697 villages (muban). The district is subdivided into 15 subdistricts (tambon), which are further subdivided into 118 villages (muban). The city (thesaban nakhon) Trang covers the whole tambon Thap Thiang. The township (thesaban tambon) Khlong Teng covers parts of tambon Na Tham Nuea. There are further 14 Tambon administrative organizations (TAO). Kantang was the original capital of Trang Province, at first in Khuan Thani, and then from 1893-1916 to the coastal Kantang itself. As the area was prone to floodings the capital was finally moved further inland to its present location. The city pillar shrine (Lak Mueang) of Trang is still located at its original location at Khuan Thani. The district is subdivided into 14 subdistricts (tambon), which are further subdivided into 83 villages (muban). The town (thesaban mueang) Kantang covers the whole tambon Kantang. There are further further 13 Tambon administrative organizations (TAO). Neighboring districts are (from the south clockwise) Palian, Kantang, Mueang Trang and Na Yong of Trang Province, Srinagarindra and Kong Ra of Phatthalung Province. The minor district (King Amphoe) Yan Ta Khao was created on January 1 1948 as a subordinate of Kantang district. Originally it consisted of six tambon - Yan Ta Khao, Nong Bo and Thung Khai were split off from Kantang district, Na Chum Het from Mueang Trang district, and Nai Khuan and Phrong Chorakhe from Palian district. It was upgraded to a full district on June 5 1956. The district is subdivided into 8 subdistricts (tambon), which are further subdivided into 65 villages (muban). Yan Ta Khao is a township (thesaban tambon) which covers parts of tambon Yan Ta Khao. There are further 8 Tambon administrative organizations (TAO). Neighboring districts are (from the east clockwise) Kong Ra, Tamot and Pa Bon of Phatthalung Province, Khuan Kalong, Manang and Thung Wa of Satun Province, Hat Samran and Yan Ta Khao of Trang Province. Originally named Yong Sata, it was renamed to Palian in 1939. The district is subdivided into 10 subdistricts (tambon), which are further subdivided into 85 villages (muban). Tha Kham is a township (thesaban tambon) which covers parts of tambon Tha Kham. There are further 10 Tambon administrative organizations (TAO). Sikao district was established in 1887. The present district office was officially opened March 1st, 1987. Neighboring districts are (from the northwest clockwise) Khlong Thom of Krabi Province, Wang Wiset, Mueang Trang and Kantang of Trang Province. To the west is the Andaman Sea.The district is subdivided into 5 subdistricts (tambon), which are further subdivided into 40 villages (muban). There are two townships (thesaban tambon) - Sikao covers parts of tambon Bo Hin, and Khuan Kun covers parts of Kalase. There are further 5 Tambon administrative organizations (TAO). Neighboring districts are (from the north clockwise) Ratsada of Trang Province, Thung Song of Nakhon Si Thammarat Province, Pa Phayom, Si Banphot of Phatthalung Province, Mueang Trang, Wang Wiset of Trang Province again and Bang Khan of Nakhon Si Thammarat Province again. Originally named Khao Khao, it was renamed to Huai Yot in 1939. The district is subdivided into 16 subdistricts (tambon), which are further subdivided into 133 villages (muban). There are three townships (thesaban tambon) - Huai Yot covers parts of tambon Huai Yot and Khao Pun; Na Wong covers parts of tambon Na Wong, Bang Kung and Wang Khiri; and Lam Phu Ra covers parts of tambon Lam Phu Ra. There are further 16 Tambon administrative organizations (TAO). The minor district (King Amphoe) Wang Wiset was established on July 15 1981 by splitting off five tambon from Sikao district. The first temporary district office within the temple (Wat) Rat Rangsan (also named Wat Ton Prang) was opened on November 2 1981. Neighboring districts are (from the east clockwise) Huai Yot, Mueang Trang and Sikao of Trang Province, Khlong Thom and Lam Thap of Krabi Province, and Bang Khan of Nakhon Si Thammarat Province. The district is subdivided into 5 subdistricts (tambon), which are further subdivided into 70 villages (muban). Wang Wiset is a township (thesaban tambon) which covers parts of tambon Wang Maprang Nuea. There are further 5 Tambon administrative organizations (TAO). The minor district (King Amphoe) Na Yong was established on April 1 1990 by splitting off 6 tambon from Mueang Trang district. It was upgraded to a full district on November 4 1993. Neighboring districts are (from the south clockwise) Yan Ta Khao and Mueang Trang of Trang Province, Si Banphot and Srinagarindra of Phatthalung Province. The district is subdivided into 6 subdistricts (tambon), which are further subdivided into 53 villages (muban). Na Yong Nuea is a township (thesaban tambon) which covers parts of tambon Na Yong Nuea. There are further 6 Tambon administrative organizations (TAO). The minor district (King Amphoe) Ratsada was established on April 1 1991 by splitting off five tambon from Huai Yot district. It was upgraded to a full district on December 5 1996. Neighboring districts are (from the south clockwise) Huai Yot of Trang Province, Bang Khan and Thung Song of Nakhon Si Thammarat Province. The district is subdivided into 5 subdistricts (tambon), which are further subdivided into 50 villages (muban). Khlong Pang is a township (thesaban tambon) which covers parts of tambon Khlong Pang. There are further 5 Tambon administrative organizations (TAO). The minor district (King Amphoe) Hat Samran was established on April 30 1994 by splitting it from Palian district. 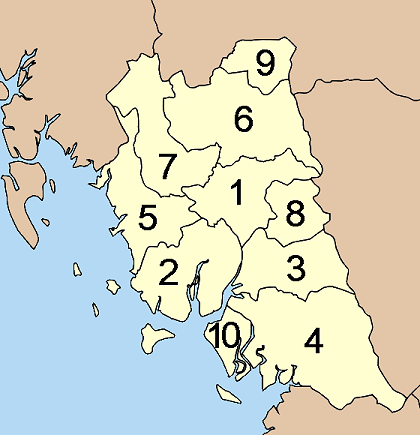 Following a decision of the Thai government on May 15 2007, all of the 81 minor districts were to be upgraded to full districts. With the publishing in the Royal Gazette on August 24 the upgrade became official. To the east is Palian district, to the north Kantang district. To the west and south is the Andaman Sea. The district is subdivided into 3 subdistricts (tambon), which are further subdivided into 21 villages (muban). There are no municipal (thesaban) areas, and 3 Tambon administrative organizations (TAO). Moreover, in all areas of Trang, clinics and pharmacies can easily be found.